Normally, around 10 percent of the school going children get dropped out from the sch ools in rural areas, for various reasons, and mainly due to poverty. Such children are being exploited as child labour and their talents get wasted. Every District Administration in India has been empowered with various schemes and enough funds. In addition, Sarava Shikshya Abhyan, National child labour project and UNICEF also support the district administrations for sending these children back to school. Many such programmes are not implemented well due to lack of initiatives from many of the District Collectors across the country. In this edition, we are bringing out an exclusive interview with Dr Santhosh Babu, IAS, presently the Managing Director of Electronic Corporation of Tamilnadu ELCOT. In his earlier assigned as District Collector of Krishnagiri district, he ws very successful in reducing the child labour and school drop outs to the extent of 95 to 97%. According to Dr Santhosh Babu, (i) identification and tracking of such children (ii) offering convergence package of schemes to such families would solve the problems for ever. They have also developed a new website www.back2school.in for this purpose. He also brought e-governance initiatives in the district for improving the administration and to reduce the corruption. The initiative like ‘Rural BPOs’ was also hailed by the various media. He was honoured with the ‘Best Collector Award’ in 2007 by the Chief Minister of Tamilnadu. Indian Express also recognized him as one of the 5 ‘Pride of Tamilnadu’ in 2008. 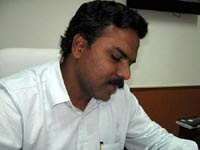 Data Quest honoured him with ‘e governance champion’ of South India in 2006. In an exclusive conversation with me, Dr Santhosh Babu describes the success story of Krishnagiri district. Please click to play to listen to his interview (20 m). The audio streaming will be smooth, if you have a broad band of minimum of 100 kbps. If the streaming is not smooth, please download the audio in mp3 format and then play..
Indian citizens are expecting the announcement of General Elections soon. Probably within three or four months, all the Indian voters will be electing the new Federal Government. All the Indian voters are concerned with (i) criminalisation of politics, (ii) Politics-Bureaucracy nexus, (iii) educated middle class apathy towards election and their lack of interest in election process, (iv) Election rules 49 (O) and (v) Electoral reforms like inclusion 'None of the above' in ballots, etc. You may also download the Voters' Guidelines issued by Election Commission of India from the following link. Scroll down to listen to Mr T S Krishnamoorthy. In an exclusive interview for PodUniversal, Mr T S Krishnamoorthy, Former Chief Election Commissioner of India shares his views on the above issues frankly. When he was the Chief Election Commissioner of India, for the first time, he introduced Electronic Voting Machines (EVMs) in all the Parliamentary Constituencies, successfully. during 2004 General Elections. After the Mumbai terror attacks on 26/11, Indian citizens across the Nation are organising events and seminars to show their anger and solidarity to combat terrorism. Shreyans Foundation, organised a seminar on 7th December 2008 at Chennai with eminent people talking on this serious issue. PodUniversal brings out an excerpt from the speech of Mr B S Raghavan, well known personality. Mr B S Raghavan is a retired Senior IAS officer of the Government of India (1952 batch). He has held high positions in Government of India, Government of West Bengal and Tirupura. He has also served United Nations on behalf of Indian Government. While, he was serving Home Ministry in Indian Government, he has handled security policy of the Government. He has authored six books. He is one of the sought after person by all the media for his views. In his speech, Mr Raghavan emphasises two points: (1) the need for a tough erlaw like Patriots Act of United States and (2) the role of Indian citizens in combating terrorism. Angry Chennai citizens come together! It is time for change!! After the Mumbai Terrorist attacks on 26th November, angry educated middle class Indians are coming together in all the Cities showing their anguish. 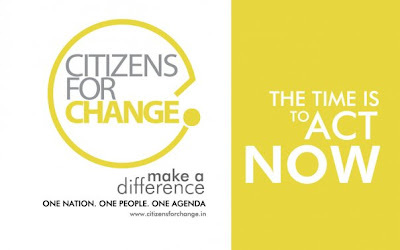 Some of the Chennai citizens have now started an initiative "Citizens for Change". 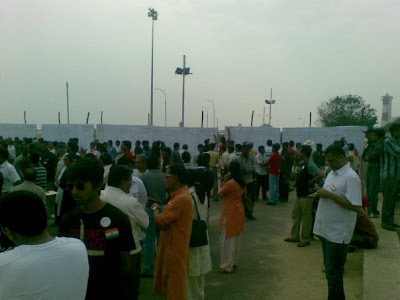 In a rare gesture, on Sunday the 7th December 2008, around ten thousand middle class and upper middle class citizens and their family members assembled at the Marina Beach and signed a pledge for solidarity and to save the Nation. Symbiosis Institute of Media and communication, pune popularly known as SIMC, a reputed media and communication school of Asia is arranging events called ‘footprints’ all over India since 1999 to promote media and communication awareness amongst the students during November and December every year. All the events are organized by their own students as part of their on the job training. 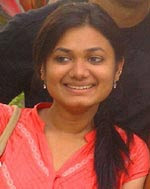 During 2008, SIMC had organized this Footprint event in 21 Indian Cities and one at Dubai, with uniform theme of Citizen journalism. The entire mega event is organized by 364 PG and UG students, by dividing the cities amongst themselves. During this year, more than 15000 young media students had participated in all the 22 footprints. They have involved more than 260 eminent professionals across the country as speakers. These footprints events generated more than 500 media reports across the country, besides social media write ups. These events involved an expenditure of around 75 lakshs, which was generated by the students through various sponsors. From this year onwards, they have also instituted two awards for the young professional ach ievers in the media line in each center. They have honoured 34 such young achievers in the current year throughout India. These events helped all the students to have an hands on experience on marketing the events, sponsorship, public relations, photogrpahy, videography, advertisement, event management, etc.